For any business decision maker, I am gifting you with my minimum standard wish list for how I would like to be treated when I contact a call center selling more sophisticated products such as property and casualty insurance. My first wish is not to be placed on hold for more than two minutes and to be connected to the right department on my first contact. I do not want to verify my identity more than once. I strongly dislike having to be trans-ferred around and so I shouldn’t have to endure this more than one time. I want to work with a professional who is qualified, competent and empowered to handle whatever issue I plan to discuss during the initial phone call. I would hope the agent is allowed enough time to listen to me as a human being without the agent having to worry if their greeting was correct; that the call flo met the company’s standards and the closing statement matched a script. As a non legal scholar, I should be able to clearly understand any legal compliance disclosures and should not have to listen to the same disclosures repeatedly. I would like to be able to count on the agent not being so micromanaged, so that there is enough time for the agent to make sure all my problems are resolved even if my issues are complicated or time consuming to fix. 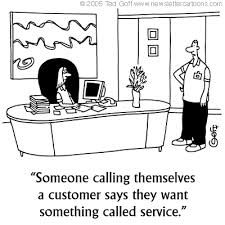 If I am calling for customer service or to complain, I do not want to be sold something not related to my call. I want my issue to be handled!!! Any information provided to me should be accurate and complete. If my request or issue cannot be completed during the initial contact, then I would like the first agent to document sufficient notes so that the next agent can assist me without me having to repeat the entire story again. All possible steps should be taken to avoid my having to make a return call. For example, if I need to email or sign a form, another agent could finish up whatever the first agent started and then email or mail me the results. Remember my time is also precious. At the end of the call, the agent can then inquire if I have any interest in learning or being sold any of your other company products. If an agent or supervisor has promised to return a phone call on a particular date and time, then I would like the agent to be able to meet their commitment. Whenever possible, I would like the extensions for various divisions to be listed on the company’s website along with the correct hours of service, so that when I call, I can just input the extension and circumvent the voice call system which never seems to understand me. Personally, I prefer to use the internet; however, please be aware that many of your more mature clients may not be comfortable using the computer. Their monies are just as green as your younger clients. If some of your clients are not computer literate, please have marketing materials to mail them along with the CEO’s name; address, phone and fax numbers; a listing of all your products; extensions for the various divisions with their business hours. If your company will treat me as I have described above, then your company will eventually reflect a “customer culture” environment. Consumers, please do not continue to enable your favorite companies to be overtaken by the “COOKIE CUTTER CALL CENTER SYNDROME.” When a company does not treat you with the dignity, respect and value that you deserve, please write or email the company’s CEO. If you “google” any company’s name, the right side of the screen should list the name of the CEO, the headquarters address and phone numbers. Occasionally, there is an email link. In my opinion, it would be better to track the number of products ( within and outside of one’s division) that an sales agent has sold as well as how much monies they have produced for the company. The referral sales’ transfers should be tracked as to which result in a closed sale. Emphases should always be placed on measuring actual results versus conformity to a set of rules such as following the outline of a script etc. An independent group could monitor the agents’ calls for quality control with the goal being to insure that the sales and/ or customer service agents consistently deliver information and assistance that is accurate, complete and disclose any legal compliance rules.They should not be aware of the identity of the agent or even the results of any previous evaluations to prevent any bias. Then the gifted sales agents would be enabled to handle calls from potential clients as suits them while still maintaining high professional sales and performance standards which are measurable. They would be empowered by having truly objective parameters to compare themselves to their peers and they would have the satisfaction of seeing how they have directly contributed to the profits of their employer. Direct management and any coaching should be of a positive and supportive nature. 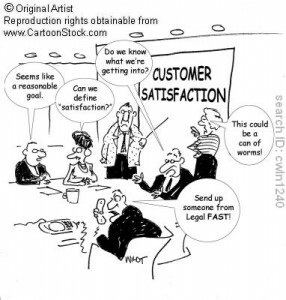 All customers should have access to a customer satisfaction survey at the end of a call without the agent being able to bar them in any way and the customer should be subject to no more than three questions.They should be offered the option to go on to the company web site to provide input and/ or there should be a well advertised, easily accessible phone number by which a customer could leave a message regarding their experience. 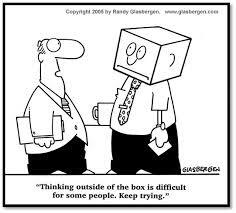 In house team meetings could include brain storming sessions by which the sales agents can share their thinking on how to improve their sales performances and customer experiences. Various levels of management could make time to attend part of these sessions without immediate management present to insure that the infrastructure is well established to allow the agents a safe haven for the free flow of ideas. More research and development could be performed to continuously provide your sale professionals with the most up to date information regarding the competitors’ products and practices in addition to verifying that your products are the best value in the market. Oh yes indeed, the outsourced model of business has injured names and products over the years and it gets worse and worse. I agree 100%. I have become more comfortable in purchasing online just because I hate talking to agents typical of the ‘cookie cutter” call center.